The role of the Coral Patrol is to look out for our ocean environment. such as littering and harming or permanently removing beach species. 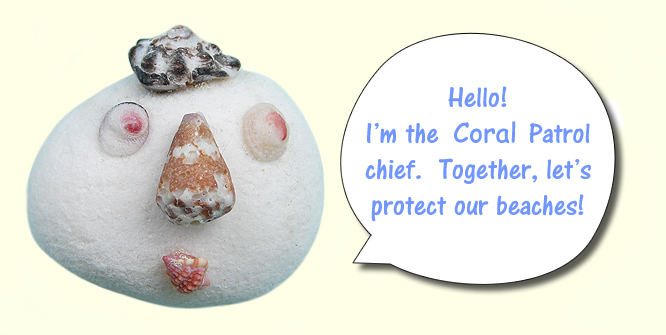 Become a member of Coral Patrol and protect your beaches! This project suggests a new direction of merchandise to support the economy of rural areas in developing nations and small islands around the world. We propose a method of making a living without selling precious beach resources and losing beach species. 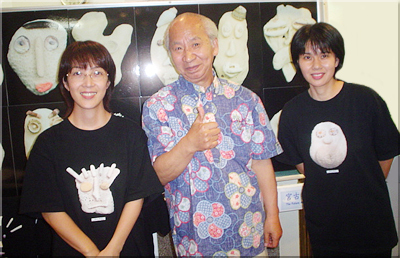 Many businesses sell shells and corals as individual pieces or as decorative pieces. By selling those corals and shells, even those that are alive, they are permanently taken away from their environments. Without directly selling or damaging those natural resources, there are possibly many other creative ways for businesses to sell products using corals and shells. Take Coral Whispers for example. The variety of pictures taken of Coral Whispers can be turned into calendars, shirts, or postcards to sell. Can you come up with some other ways in which local businesses can make a living by using shells and corals without harming or permanently removing them from their environments? what thrives in the ocean. as a member of Earth's ecology? Beyond becoming a piece of art, each character symbolizes our respect for the environment and desire for future generations to share this love for their environments. With anticipation, we hope to see such relationships with the environment not only on the beaches of Miyako Island, but on beaches worldwide.